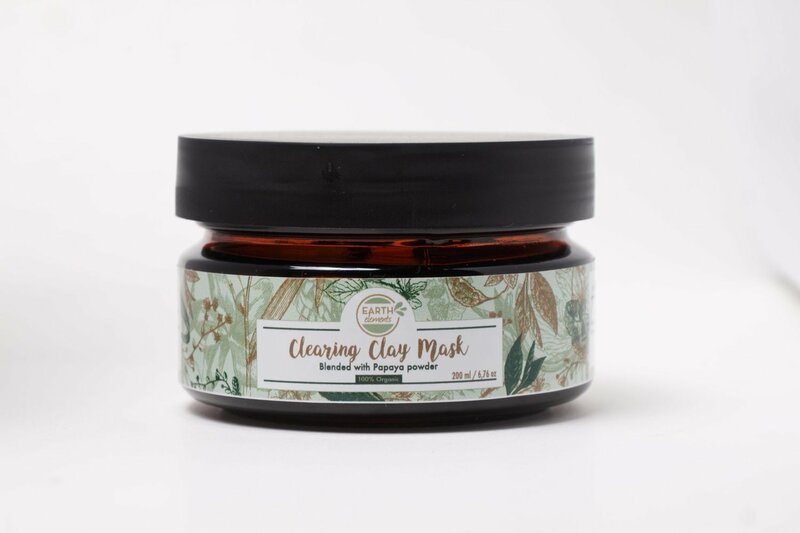 Our Clearing Clay Mask has a myriad of skin benefits ��� it soaks up excess sebum and draws out toxins, leaving a smooth and flawless complexion. A blend of powerful clays, extracted from aged volcanic ash with an array of skin loving nutrients that are beneficial for healthy, glowing results. With a non-metal spoon and in a small non-metal bowl, mix 2 to 3 teaspoons of the clay with an equal amount of either water, yoghurt or apple cider vinegar. Apply the paste to clean/exfoliated skin ��� avoiding the eye and lip area. Leave on for 15-20 minutes and rinse with warm water. Use once or twice per week. Papaya powder, Activated Charcoal, Bentonite Clay. Helps clear skin disorders and problems like eczema, psoriasis, acne and pimples. For best results, use along with Earth Elements Clearing Balm.